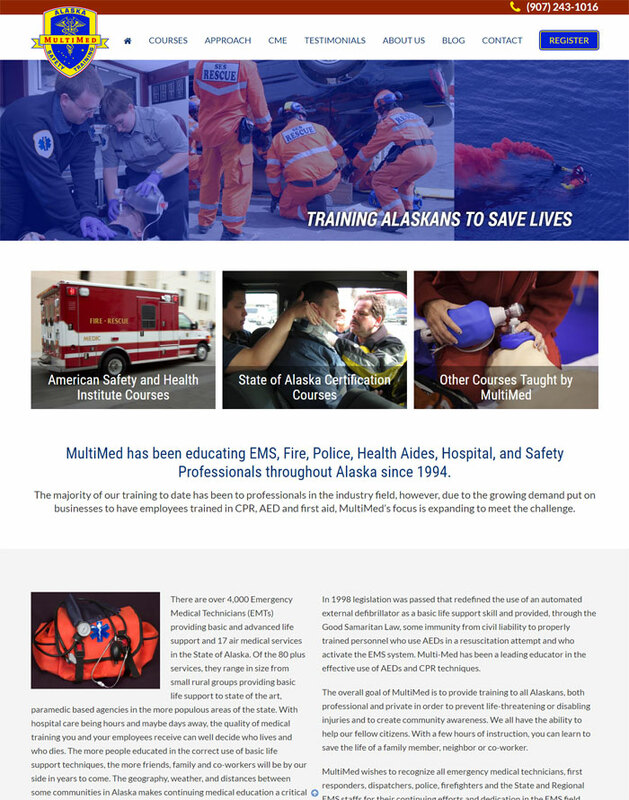 We are proud to announce the new website launch for Alaska MultiMed, a training provider that offers courses that teach hands-on medical skills for rescue and safety teams in Alaska. Their courses cover a wide array of medical care topics including basic first aid for the workplace, wilderness first aid, first responder techniques, and emergency medical response. We built their original website about 10 years ago. While that site held up well for its age, they needed a more modern website that was optimized to work on mobile and tablet devices. Our team built a custom WordPress website designed to educate customers and make registration simple. We focused on designing a professional and simple website that emphasized the real-world training provided by Alaska MultiMed. The large photos of rescue teams in training showcase the real world outcomes of the courses. The easy-to-read navigation helps user find details on the certification courses and read information about the company. Their new website has a professional look, and their updated design will serve as a valuable tool for educating customers. View the new Alaska MultiMed website here.